Home » Blog » Planning is not an option; it's a requirement. I'm not sure but my guess is that when Martin Cooper, (a Motorola employee then) stood in midtown Manhattan in 1973 and placed a call to the headquarters of Bell Labs in New Jersey he probably didn't have a clue as to what he had just invented. I mean if the mobile phone was a human being, by now that baby (mobile phone) that was born on 3rd April, 1973 would be 41 years and 4 months old and as would be expected at that age, s/he should be a mature human being by now. Of course maturity is relative because as the late Maya Angelou said, "most people don't grow up. Most people just age. They find parking spaces, honor their credit cards, get married, have children and call that maturity. What that is, is ageing". I believe it is safe to say that mobile technology has not only matured but it has evolved several times over, and it is evident that it will continue to do so as time goes by. If it were to be likened to a human being, we would say it has grown in wisdom and continues to age gracefully. Today, the mobile phone is used to do much more than just call or receive calls. Infact, it is no longer called a mobile phone but a smartphone because it allows its users to do much more than they could ever have imagined possible 41 years ago. Of course the smartphone was not invented by Cooper but just 20 years after the invention of the mobile phone, IBM and BellSouth released the first smartphone to the world. I trust God for long life so that I can still be alive to see what will be happening 41 years from now in the mobile technology world, but my guess is that at that time what we have today will look like the most outdated technology that ever existed. If you think my imagination is running wild, you tell me how many of you are still using Nokia 3310. Just as a by the way, did you know that some of the first mobile phones (not smartphones) were sold at USD 4,000 (Tshs. 6,637,902/-) and weighed about 2 pounds (nearly 1kg)? Today, we have smartphones that are as cheap as USD/Tshs 0 meaning they are given by the service providers for free, whereas today the lightest smartphone could weigh as little as 100gms. If that's not "maturity" then I don't know how to define the life cycle of mobile technology. Well, it was through one of those smartphones that someone sent me a very interesting and thought provoking image via an app called whatsapp. Now if you are a smartphone user and you have no whatsapp on your phone then I suggest you go for deliverance because there must be something awfully wrong with you...#Justsaying. I say this because it seems like in the smartphone commandments, commandment number one says, “thou shalt not lack whatsapp on your phone”. Anyway, I digress. The image sent to me had this gentleman in the toilet and from the look on his face it seems like he had just gone through "hard labor". Of course I am assuming that like any normal hygiene conscious human being he would need to clean himself up after he finished his business. I guess he must have been very pressed when he went into the toilet and did not bother checking whether all the resources he needed to finish his task successfully were all available. Such resources include enough toilet paper, water to flush after using the toilet and of course water to wash his hands after use. Unfortunately he found out when it was too late that the toilet paper was finished. I don't want to speculate but I wonder how he sorted himself out... Again I digress. Moving on, what grabbed my attetion on that photo is not even his face after he realized his dilema. 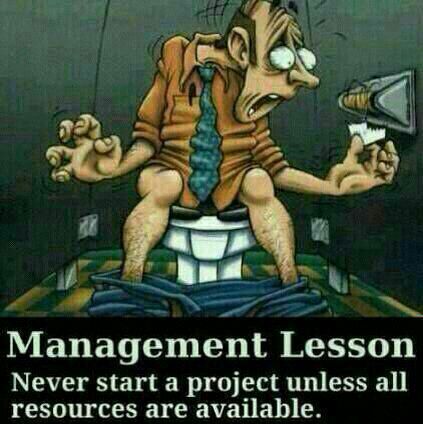 My attetion was caught by the caption on the photo which said: "Management Lesson - never start a project unless all resources are available". What a lesson indeed! You might be laughing at this guy but the truth is, so many people find themselves in the same exact situation either literally or in other areas of life. I personally know of someone who had to use their handkerchief because they found out too late that there was no toilet paper in the toilet. Another one used their undergarment and had to walk around undergarment-less for the rest of the day because just like the guy in the picture, they found out too late that the resources in the toilet were not enough to do the expected job. Take for instance a sales deal you have been planning on following up on, what do you need to do in order to ensure that you minimize your chances of wasting time following the wrong lead? Well, to highlight just a few things, you need to know what the company you are targeting does; where and how your service/product would add value to the company; whether they already have another supplier for the same service/product you want to talk to them about; if possible find out whether your rates are competitive enough; who the right person to talk to in that organization would be and when the best time to talk to them would be, etc. Unless you are one very lucky sales person, walking into an organization blindly without finding out all these details (and more) is a sure setup for instant failure and disappointment. At least even find out where the company is located for goodness sake! How about planning your day? This too can be categorized into a project. Many people just leave home and go to their places of work or businesses without a clue as to what they will be doing between the hours of 8am - 5pm. As a result, they end up wasting their entire day doing things that don't help them in meeting their targets and goals (assuming they have any in the first place). I don't mean to be abusive but such people remind me of a dog that keeps chasing its tail. If it caught it, what would it do with it? Or another that chases after cars, would it drive the car if it caught one? In other words, without planning, people end up spending time doing all the wrong things and in the end, they wonder why they did not achieve much. Like someone said, "failing to plan is planning to fail". 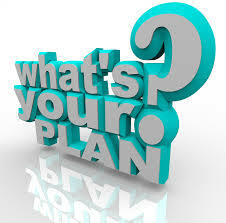 Learn to plan every hour of your day and in as much as sometimes some emergencies and urgent issues come up, you will be able to find a way of dealing with them because at least you have the basics covered. We only have four months left before the year comes to an end. I say four because December is not really counted as a month to do much unless of course you are in the hospitality and transport industries, or you sell clothes and gift hampers - I believe you get my drift. For the rest of us, if by the 1st week of December you will not have attained your target, then you will need divine intervention to meet it any time after that. So, now that we only have four months left do you have a plan to do things differently in order to achieve the desired results? If whatever you were doing before works for you then only better it but if it is not working for you, then you need to replan. Don't join the insane people's club where they do the same thing over and over again and expect different results. If you start doing the right thing now, you can make a significant difference to your bottom line by the time the year ends and come the beginning of 2015, you will be ready to hit the ground running because you will have learnt the importance of planning your work, your day, your projects and of course your life. Wishing you all a properly thought-out and planned week. PS: Article published in Tanzania's Guardian on Sunday on the 10th August, 2014, under my weekly column "Thoughts in Words"